Odd time drum loops covering 3/4, 5/4, 5/8 7/4, 7/8 and 9/8 time signatures. Use for fusion tracks or more rock-based odd time projects. Get some wicked odd time drum loops when you just need a little more than the old “two and four.” There is nothing like a groove in five or seven to take your playing and music to an entirely different level. 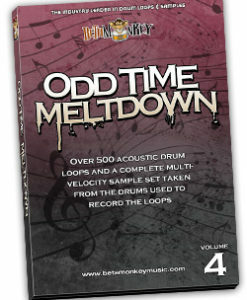 Beta Monkey Music is proud to release the remedy to the “common-time blues” – Odd Time Meltdown. 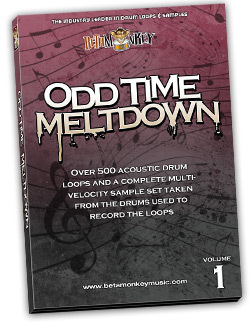 Our third installment in the Signature Series, Odd Time Meltdown is a complete package, featuring over 500 acoustic drum loops and a complete multi-velocity sample set taken from the drums used to record the loops. Get your groove on in 5, 7, 9 (and beyond), Odd Time Meltdown will get you thinking differently about your music and playing. Cohesive Drum Sounds: All odd time drum loops are are from a single recording session. All grooves, fills, one shots, and samples feature the same drums and mix. Like to change tempos or time signatures? You can mix any loop with anything else on the disc. The bottom line here is maximum versatility. 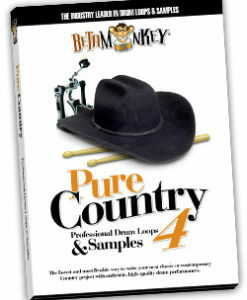 Fully-Sampled Drum and Cymbal Samples: Build even more great grooves with a complete multi-velocity sample collection. We’ve included a complete set of all the drums and cymbals recorded on Odd Time Meltdown as single hits. Create realistic grooves, augment the loops, create breaks, stops, and accents – having the full matching sample set gives you the flexibility to do just that. One Shots and Extras: We have also included cymbal swells, ending fills, mini solo sections, and more “uncharacterizable” rhythmic pieces. In essence, you get all the “little” things most drum loop CD’s ignore or neglect but are vital to realistic drum tracks. We’re drummers – we know what you and your music needs. 514 (435 MB) original, license-free 16/44 drum loops and samples in 16-bit WAV, AIFF/APPLE LOOPS and REX2 formats. ALL ACIDized WAV, APPLE, and REX2 formats included with digital download or DVD.